Boot the installation system and wait for the boot menu to appear. In the menu, edit boot options (see ../install/Booting_the_Installation.adoc#sect-boot-menu) and append the inst.vnc option to the end of the command line. You can then proceed with ../install/Installing_Using_Anaconda.adoc#chap-installing-using-anaconda. VNC connect mode is when the system being installed initiates a connection to the VNC viewer running on a remote system. Before you start, make sure the remote system is configured to accept incoming connection on the port you want to use for VNC. The exact way to make sure the connection will not be blocked depends on your network and on your workstation’s configuration. 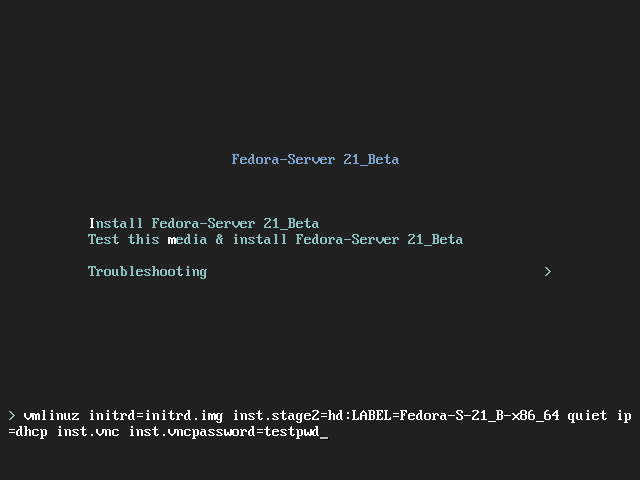 Information about configuring the firewall in Fedora is available in the Fedora Security Guide, available at http://docs.fedoraproject.org/. Commands for using a VNC installation are also available in Kickstart installations. Using just the vnc command will set up an installation using Direct Mode. Options are available to set up an installation using Connect Mode. For more information about the vnc command and options used in Kickstart files, see ../appendixes/Kickstart_Syntax_Reference.adoc#appe-kickstart-syntax-reference. When installing headless systems, the only choices are an automated Kickstart installation or an interactive VNC installation using connect mode. For more information about automated Kickstart installation, see ../appendixes/Kickstart_Syntax_Reference.adoc#appe-kickstart-syntax-reference. The general process for an interactive VNC installation is described below. Set up a PXE server that will be used to start the installation. Information about installing and performing basic configurating of a PXE server can be found in Network_based_Installations.adoc#chap-pxe-server-setup.